Secure valuables, equipment, and chemicals safely away in this aluminum security cage with 23-1/2" x 45-3/4" shelves and hasp lock. 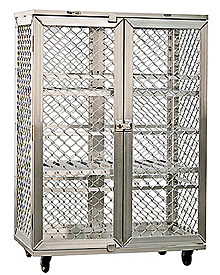 The security cage has an all-welded aluminum frame with expanded aluminum mesh side, front and back panels. The double doors are equipped with stainless steel hinges. Shelves have a clear space of 19". Mobility is gained with 5" wheels on plate type casters. Comes with a manufacturer's Lifetime Warranty against rust and corrosion.